Malaysian Anti-Corruption Commission (MACC) officers raided the Wildlife Department (Perhilitan) Tuesday morning and seized a computer and files from the office of Perhilitan’s Deputy Director General Misliah Mohd. Basir. 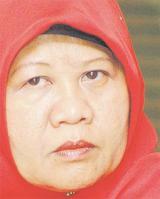 Read the story in The Star and in the NST. The following story appears today in Malaysia’s national newspaper, The Star. The implications of this investigation extend well beyond Malaysia. One corrupt, or even lax, regulatory regime can enable traffickers to move endangered wildlife from every corner of the earth–all they need is a signature, and a CITES stamp. 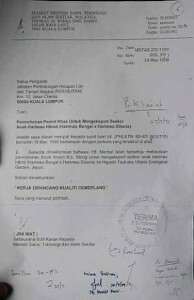 Paper trail: This letter about an application to export tigers is among the documents handed over to the MACC. KUALA LUMPUR: A group of animal rights activists has submitted documents to the Malaysian Anti-Corruption Commission to back their allegations against the Wildlife and National Parks Department (Perhilitan).